Students can print documents on any networked printer on campus through the use of a commercial software program called PaperCut. Your Computer fees help subsidize printing. All students get 500 credits ($5.00) from the University. College of Design students get an additional 3000 credits ($30.00). After using up your initial 3500 credits, additional printing costs will be charged directly to your U-Bill, and your PaperCut balance will appear as negative. Printing charges that appear on your U-bill require a $1 minimum. However, the maximum amount that can be charged past the initial 500 units is 5000 units ($50) per semester although a student can make a request through the Solution Center for that amount to be increased. Costs for printing is based on the type of printer; typically 5 credits ($0.05) for black and white prints while color printers around campus vary based on page size and quality of the print. To print to the printers in our output center (room 426), the Armory or Design on Main you will need to go through a couple of steps to release your job. Not all PaperCut printers at Iowa State will require you to release your print. Print your file as usual, selecting either DSN-426-BW-Printer-1, DSN-426-BW-Printer-2, DSN-Armory-Color-HPM855xh, DSN-On-Main-Color-M855 from the list of printers (click here to get information about installing them on your personal machine). 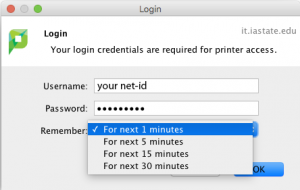 A dialog box will appear asking you to login to PaperCut in order to authorize your print. This helps protect your print credits from unauthorized use! Enter your net-id and password, and set the duration you’d like your credentials to remain active. Click OK.
A window will appear stating that your job is being held in a print queue on the server.This stops your job from printing until you tell it you are ready to print. You can also cancel your job from the print queue as well. To release your job, click the “Details…” link in the PaperCut Client window. This will open up the PaperCut website. Login to the site with your net-id and password. Click the “Jobs Pending Release” link in the sidebar. Click “print” to print your job, or “cancel” if you’d like to cancel your job. Pick up your prints in room 426 Design or in room 75 Armory. The printers are labeled with the printer name. If for some reason your job fails to print, please email nielandj@iastate.edu with the name of the printer, the name of the file, and the date/time of the print.